The Acropolis meaning, ‘the highest point in the city,’ is an ancient settlement that boasts a history as rich and storied as a classic myth. 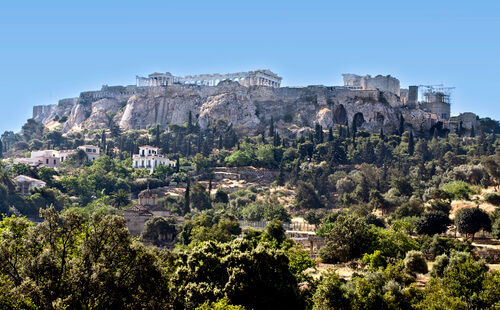 Located on the flat top of a rocky hill above the city of Athens, this UNESCO Heritage Site contains archaeological remains of temples, statues, sanctuaries and theatres that honour and celebrate Greek civilisation. With gates and a border that helped the settlement withstand attacks from the Persians and sieges from the Venetians, Greeks and Ottomans, some of the Acropolis’ fortified walls have stood for more than three millennia. Visitors enter through the monolithic Propylaea gateway located at the west of the site. Commissioned during the 4th century BC, the gateway is decorated with iconic Greek columns that sit at the top of a set of steps. The stairway itself was carved from the rocky hillside on which the settlement sits and was partly restored in the 20th and 21st centuries. The temples on the Acropolis’ north side – such as the Parthenon, Erechtheion and the Temple of Athena Nike – are among its oldest and most iconic buildings. 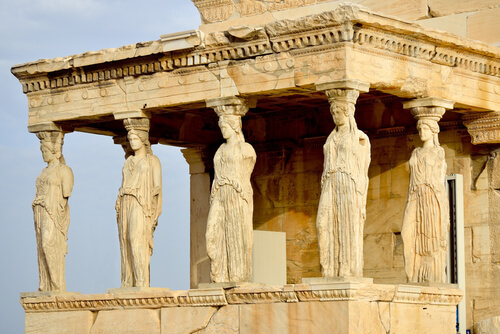 They and many others were originally dedicated to the goddess Athena, considered the patron of Athens, and contain well-preserved structures fashioned from both marble and limestone. To make these, Greek sculptors utilised the local materials and landscape to a stunning effect. Walking distance from one another, the Acropolis’ temples form part of a larger precinct that can be navigated on foot, ensuring that visitors can both bask in the Athenian sun and soak up the history, architecture and archaeology. Many of the Acropolis’ buildings that were once places of worship have been converted during different eras into temples, churches and mosques. Since the 19th century, there has been an effort to restore and preserve the site’s Greek heritage. 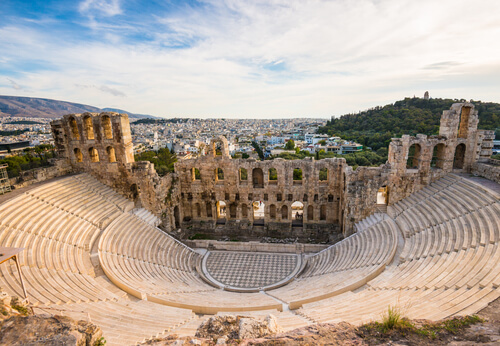 To the south, vast structures such as the Odeon of Herodes Atticus and the Theatre of Dionysus offer stunning views down onto the city below, while standing testament to their own remarkable histories. The Odeon of Herodes Atticus was a venue for concerts in ancient times and has been successfully renovated to host modern artists in recent years. The Theatre of Dionysus is considered by many to be the first modern theatre in Europe and possibly the world. Its acoustics enabled crowds of thousands to gather to watch plays for centuries. Like the Odeon of Herodes Atticus, its space has now been restored so that modern productions can be staged on its grounds. Visitors are advised to arrive at the Acropolis early in the day and beat the inevitable crowds. The main site is flanked by streets that contain plenty of places to stop for food with options ranging from quick, easy bites at the Artopolis Of Takis bakery to fine dining across two floors at the world-renowned Manhmanh restaurant. 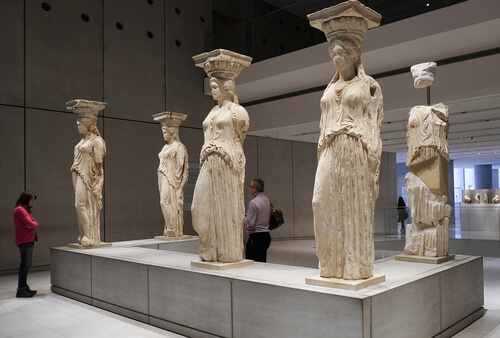 Those looking to beat the heat can navigate the air-conditioned Acropolis Museum located nearby. Be sure to look down when you enter as a glass floor reveals the ruins of an ancient Athenian neighbourhood. The restaurant also has stellar views. Various tickets for the Acropolis including walking tours, are available and start at €12 (AU$20). Entry to the Acropolis Museum is approximately €5 (AU$8).